Talk about your pile of pretty stuff! 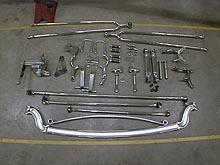 The front-end components came from Yogi's, Durant Enterprises, and Flaming River. My mother once told me I reminded her of a rat (nice mother huh? ;) because I loved things that shine and sparkle. Well, this front end will definitely sparkle! It should also ride nice because of the Durant Mono Spring and adjustable perches. 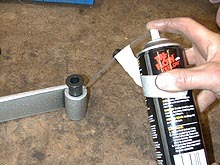 We used a little TriFlo (Teflon/silicon) spray to help insert the spring bushings. 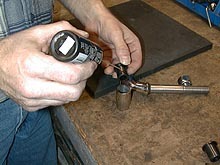 The bushings are then gently tapped into place with a mallet. Here's a good view of the spacers that adjust ride-height when you use a Durant Mono Spring. This is one of the key reasons I decided to go with one. Another reason is that everyone I've ever spoke with who has one loves it! There's no better advertising than word of mouth. I had a nice talk with Jim Durant when I purchased the spring and perches. He's a real nice guy and he gave me a few valuable tips. At his suggestion I had the spring powder coated to retain the springs flex quality. I'm going to insert a blatant plug here for T & C Powder Painting. They are the ones who painted my spring and spindles. I've used them in the past and these guys do a great job at prices that make you wonder how they can keep the doors open. (I hope they don't read this and raise their rates!) I'll be taking other stuff to them to do later, like the roll cage, etc. The spring and spindles are metallic silver. 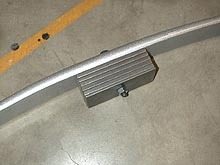 The first step in installing the front-end is to mount the spring. For mock-up purposes, I put all the ride height shims in the bottom of the spring. Four hands come in handy for this job. 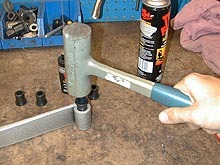 I used a little TriFlo lube on the perch bushings also and tapped them in with a mallet. 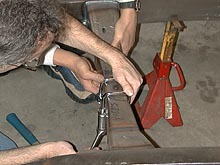 These perch's have a swivel that allows you to align the front-end without putting any bind on the spring shackles. This helps make a smoother ride. These pieces are polished stainless steel… very pretty!